We offer adventure trips and classes for kayaking, rock climbing, backpacking, and mountaineering throughout California, the Bay Area, and beyond. Our Bay Area retail store offers kayaks, paddleboards, backcountry and cross country skis, telemark skis, alpine touring equipment, and more. We also offer ski, snowboard, and kayak repair. 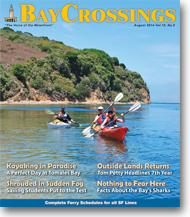 Read about our Tomales Bay Kayak Tour in Bay Crossings. Follow us on Twitter for updates and weekly deals. Outback Adventures is a comprehensive outdoor adventure guide service, rental shop, and paddlesports and nordic ski specialty retailer located in the San Francisco Bay Area. Outback Adventures offers some of the best outdoor adventure trips and instruction throughout the San Francisco Bay Area and California. Our kayak lessons and kayak adventures take place throughout the San Francisco Bay Area and are offered for beginner and advanced paddlers. For outdoor rock climbing lessons and instruction in the Bay Area, we offer climbing trips at Castle Rock State Park and Cragmont in Berkeley. Guided backpacking trips in Northern California take place at Yosemite National Park, Lassen Volcanic National Park, the Santa Cruz Mountains, Big Basin and other areas throughout California. Take a look at all of our offerings and experience the best San Francisco Bay Area adventure activities with us! Outback Adventures is Now Hiring for instructors, guides, and sales staff. We offer adventure trips and classes for kayaking, rock climbing, backpacking, and mountaineering throughout California, the Bay Area, and beyond. Be sure to check out the outdoor places to go section that describes some the areas that we visit. We have two waterfront locations where you can rent kayaks and rent paddleboards. Our store offers kayaks for sale, and a complete backcountry ski shop with cross country skis, telemark skis, alpine touring equipment, and much more. Also, be sure to check out our downhill ski and snowboard rental department with the best prices in the Bay Area. Throughout all of our services Outback Adventures has earned a reputation for personal friendly service and exceptional technical expertise. Come experience the difference you deserve. Looking for a great deal on new and used outdoor gear? Check out Outback Adventures new Gear Trader. Buy, Sell, Trade, or Beg - it's all free! Our picture gallery highlights our best outdoor adventures, lessons, and classes conducted in California and throughout the Bay Area.